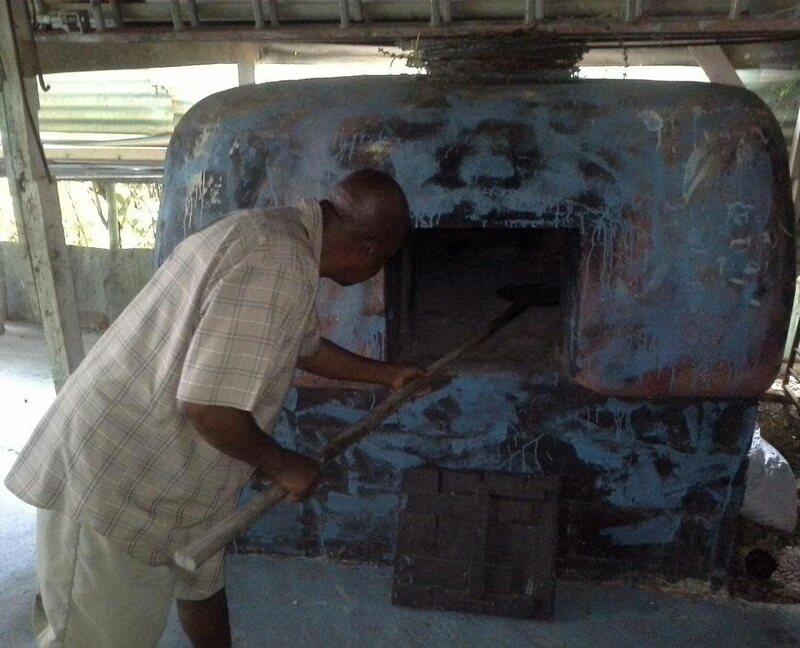 Richard Alfred, co-owner and manager of the Itsy Bitsy Folk Theatre and Museum in Mt Pleasant shows the dirt oven (still in use today) on display. This oven was built in the 1960s and can hold 25 cakes and sweetbreads at a time. Richard Alfred and his wife Annette are collectors of Tobago’s history and heritage. “My wife Annette and I have been collecting artefacts for as long as I can remember. It is something that we enjoy doing as a hobby. We would visit the homes of friends and relatives just to collect items which were used by their parents and grandparents back in the day, that they no longer use, and we would bring them home, clean them up and stow them away, Alfred said in an interview. “Our reason for doing this was so that we can show our children and grandchildren the items that were used by our ancestors. In other words, we wanted to preserve our cultural heritage. After a while, we started getting calls from various persons who would invite us to their homes where they provided us with tons of artefacts,” he added. Richard Alfred, co-owner and manager of the Itsy Bitsy Folk Theatre and Museum in Mt Pleasant, turns the handle of the ice-cream pail on display. After a while, the collection grew so much so that there was not enough storage room in their house, so they decided to build a special room to accommodate the artifacts. And then people started visiting their home just to have a look at the items. So, of course, the storage room became a museum - The Itsy Bitsy Folk Theatre and Museum. 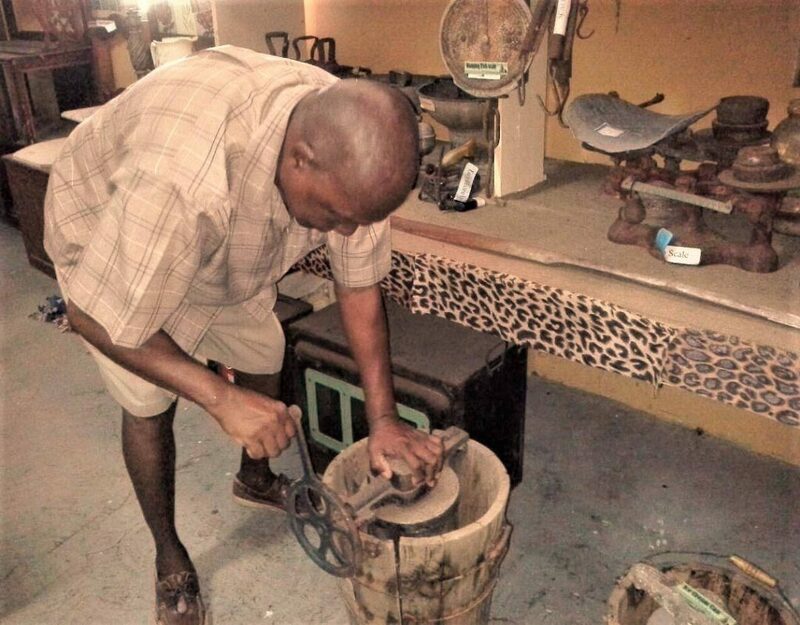 The theatre is not currently functional, but the museum houses an impressive collection of Tobago artifacts including pieces of furniture - rocking chairs, table, cabinets, safes - and cooking utensils. “Because of the interest shown by persons who desperately wanted to view these items, we decided that we are going to convert the room into a museum, so that not only our children and persons in the community would able to view them, but also visitors coming to the island from various parts of the world will get the opportunity to also see as well as learn something about our history,” Alfred said. 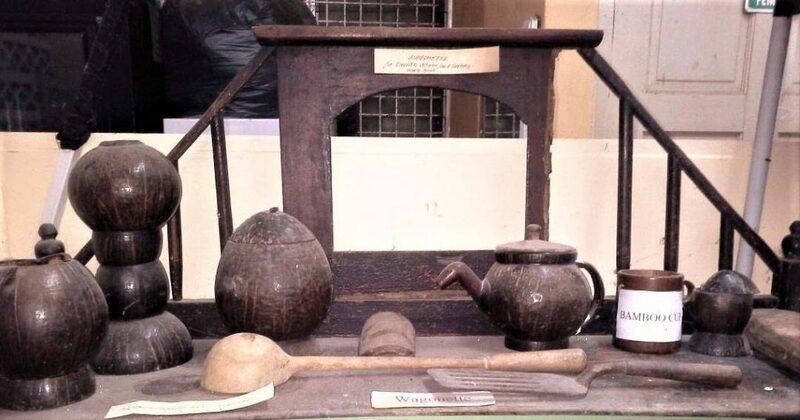 Kitchen utensils made from coconut shells and bamboo and other hand-crafted items are on display at the Itsy Bitsy Folk Theatre and Museum in Mt Pleasant. “I strongly believe that we must preserve our cultural heritage. Our children and grandchildren must know their history, where they came from. Knowing this will cause them to better appreciate the privileges that they have available to them now. “For example, while they are enjoying the benefits of our modern-day technology - the washing machines that wash our clothes for us without us having to expend an ounce of energy, and the electric light bulbs which allow us to see better in the night - they need to know that our ancestors were not so fortunate to have such amenities. They spent all day washing their clothes in a large basin or tub with water and scrubbing them on a board with a corn stick, and in the night, the only light that they had available to them was the flambeau and in some homes, the kerosene lamp,” he added. Alfred noted that many of the items were designed and made by its users – the scrubbing board, mortar and pestle, dirt ovens, fireside and swizzle sticks. “So, as we use our washing machines, our electric cookers and many of our modern-day gadgets, let us not forget our ancestors who were not as lucky as we are today, they had to work very hard to get the things which they needed,” said Alfred. Reply to "Preserving the heritage at Itsy Bitsy"